Kendall Jenner certainly made sure she got noticed as she went for a hike in Malibu on Saturday with Jaden Smith and some friends. Kendall poured her assets into a tiny Nike sports bra top with thin straps and didn't seem to worry about exposing so much flesh as she hiked through tall grasses in the heat. The teen stunner wore knee-length black workout leggings and neon green trainers with her hair up in a bun and some hooped earrings that matched her neck chains and sunglasses. She started out on the walk wearing a cropped red and white track jacket but soon ditched it and wore it tied around her waist. In contrast, Jaden, an aspiring musician, stayed covered up for the Saturday outing. He wore a long white t-shirt over skinny black pants and paired them with black Nike athletic shoes. He carried a rucksack and tied his dreads back into a short ponytail. The eldest of Kris and Bruce Jenner's daughters and movie star Will Smith's son live close to one another in the exclusive Calabasas area north-west of LA. And Jaden, a budding musician, has been romantically linked with the model's younger sister Kylie in the past. 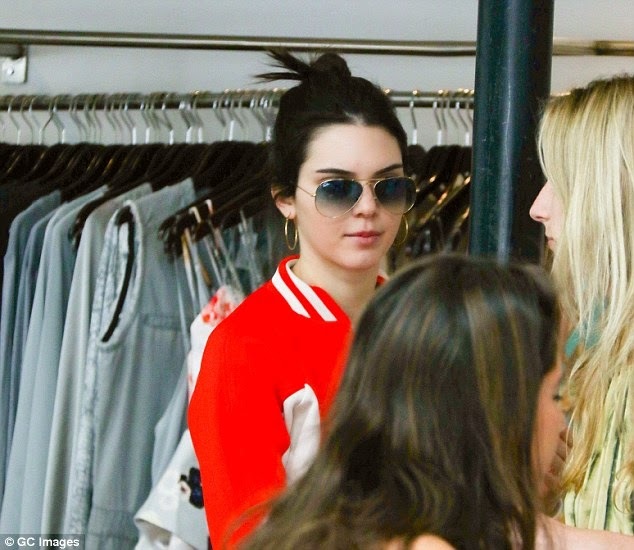 Afterwards Kendall and some of the others dropped by a local shopping center for a spot of lunch and some shopping. The teen, whose hair and makeup were flawless, chowed down hungrily on a large tuna sandwich at an outdoor table at the Malibu Kitchen Restaurant. Having replenished her energy, she was fit enough to indulge in some retail therapy and browsed clothing and accessories at the nearby Planet Blue and Curve boutiques.